Vermilion City is the first stop for the luxury liner S.S. Anne, now on its annual Pokémon cruise. It's full of rival trainers, but for now keep focused on a few interesting pleasures in the city itself, including the chance to get a Bike Voucher! Then, after you finish on the ship, return here to challenge the shocking local Gym Leader, Lt. Surge. Farfetch'd, a ninja duck that beats its enemies with a giant leek, is pretty horrible in battle. While Farfetch'd has access to Swords Dance and Slash which always makes a critical hit if it hits, as well as boosted experience due to being traded, none of those strengths overcome its terrible stats. More importantly, Farfetch'd learns both Cut and Fly, making it extremely useful as an HM slave. Being available in the same town as the Cut HM for the mere cost of the immediately available Spearow makes Farfetch'd a Pokemon you will not want to miss. The trader won't deal with Yellow players, but they can talk to the policewoman just outside for a free Squirtle once they've won the Thunder Badge. She is hoping that you will take good care of it. It's only Level 10, so it'll take a while to train, but you won't get many other Water-types for a while. With the trainers at Route 11 and the Digletts at Diglett's Cave however, it can catch up with the rest of this game's Pokémon levels quickly. Red and Blue players can trade a Spearow for a one-of-a-kind Farfetch'd in the building above and to the right of the Gym. Don't hesitate to make this trade if you have an extra Spearow! If you don't have a Spearow to spare, you'll get a chance to grab one in the upcoming Route #11. Farfetch'd isn't really a good in-game Pokémon to be honest but it can be useful as a HM slave and can learn the Cut, an HM move which will be needed after the S.S Anne. 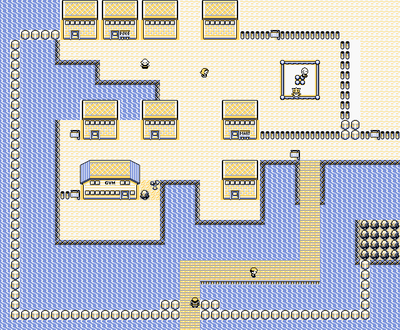 Convince the man in the building west of the Pokémon Center that you love fishing as much as he does and he'll take a shine to you. He will give you his Old Rod as a gift! Now you can use it near any body of water and get... a Magikarp. Or... another Magikarp. Yes, that's all this rod catches. You could have saved 500 if you didn't buy one from the Mt. Moon Pokémon Center earlier, wooooo. 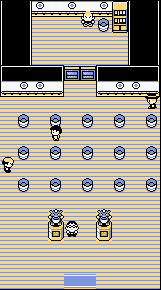 An item slightly cooler than the Old Rod can be found at the Pokémon Fan Club, located directly above the Gym. Listen to the president's boring story about his brags and he'll give you his Bike Voucher. Redeem it at the Bike Shop in Cerulean City, and you'll get a Bicycle that you can use almost anywhere to increase your movement speed. If you come back with Surf, you can also get a hidden Max Ether five squares east and two squares north of the entrance to the Pokémon Fan Club house. Use HM01 Cut (obtained after the events on SS. Anne) to hack down a bush and reach the Vermilion City Gym entrance. Once inside, you'll be confronted by a few trainers and a double-locked door. To reach Lt. Surge, you'll have to find the two switches hidden in the trash cans on the floor. The switches are randomly located, but once you find one, the second will be right next to it. If you don't get it on your first try, the switches will reset and move and you'll have to search again. One trick that you can do is to find the first switch, then save your game, then find the second switch, and if you get the wrong trash can, you can then reset the game which would bring you back to where you have already activated the first switch and try finding the second switch again. While Lt.Surge's Voltorb and Pikachu in Red and Blue are pretty easy to deal with, Raichu can pose a slight threat, but Ground-type Pokémon like Geodude and Sandshrew are completely immune to its Electric attacks (and the former resists its Normal-type moves as well), and your Electric and Grass Pokémon resist them. For offense you can use your own Ground-type attack, Dig, for devastating damage since his Pokémon have weak defense stats. With any luck, you caught a Geodude or two back at Mt. Moon. If you didn't, make a detour down by Route #11 into Diglett's Cave. There, you can capture some Diglett and Dugtrio to even out the odds with Lt. Surge. Otherwise, stick with regular attacks, as long as they aren't Flying- or Electric-type. Your prizes include the Thunder Badge and TM24, which can teach the powerful Electric-type attack Thunderbolt to a variety of Pokémon. This includes Pikachu, although in the Yellow version it'll learn it by itself at level 26, so you may want to use it on something else, or save it for another Electric Pokémon. Additionally, the Thunder Badge increases your Pokémon's speed stat by 12.5% for in-game battles only. This page was last edited on 18 November 2018, at 18:18. This page has been accessed 1,340,181 times.